A former commander of the Swiss Guard, the small force of men whose job it is to protect the pope, says there is “a network of homosexuals” within the Vatican, the latest in a series of claims about gay priests working at the heart of the Catholic Church. Mader, 50, from the canton of St Gallen, refused to comment on speculation that he had warned guardsmen about the behaviour of certain priests. Earlier this month, the same newspaper reported the claims of a former, unnamed member of the Guard that he had been the target of more than 20 “unambiguous sexual requests” from clergy while serving in the force and had been sexually harassed by members of the Roman Curia, including on at least one occasion by a Cardinal. 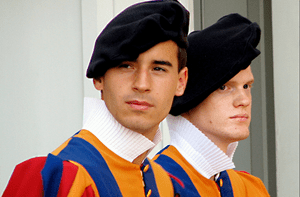 At the time, spokesman Urs Breitenmoser said the rumoured gay network did not pose a problem to the Swiss Guard, whose members, he said, were motivated by entirely different interests. Mader, while he said he did not have a problem with homosexuality, said he feared that a network or secret society of gay people within the Vatican could pose security problems. He added that he would not have promoted a gay man in the Guard – not because of his sexuality but because “the risk of disloyalty would have been too high”. Mader’s comments about the supposed threat posed by gay guards and priests drew criticism among rights advocates in Italy. “Along with all gay people in the armed forces, I would advise Mader to become better informed,” said Aurelio Mancuso, chairman of Equality Italia Prima lobby. The Swiss Guards have served as bodyguards and ceremonial guards to the Pope since the late 15th century. FRC Hate Group Video: Only 5 Million More Evil Anti-Gay Christian GOP Extremist Needed To Control America…..